Addressing soil microbial respiration responses to temperature. 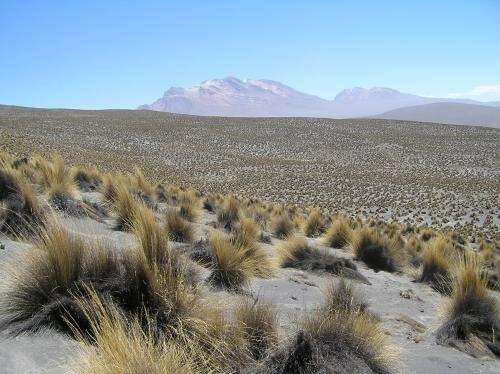 Do soil microbial respiration adapts to ambient temperature in global drylands? Soil microbial respiration is major process in soil carbon loss to the atmosphere. Its response to an increase in temperature is expected to aggravate the anthropogenic climate change. We analysed the soil microbial respiration to temperature, and we found that thermal adaptation dampens this negative effect of temperature on soil microbial respiration. In science, such as in life, things don’t always happen as you have planned and that is the amazing and beautiful part of it. Four years ago I started a PhD focus on the study of infectious Bacteria, but I couldn’t finish it for several reasons. Two years later than I left my first PhD, I had the chance to return to the science starting a new PhD in Ecology. As I didn’t want to fully abandon Microbiology, we decided to slightly modify the PhD topic to include this subject. That is how I started to study soil microbial respiration in drylands at different spatial scales. The first experiment of this new PhD, from which this paper is derived, was a laboratory incubation. 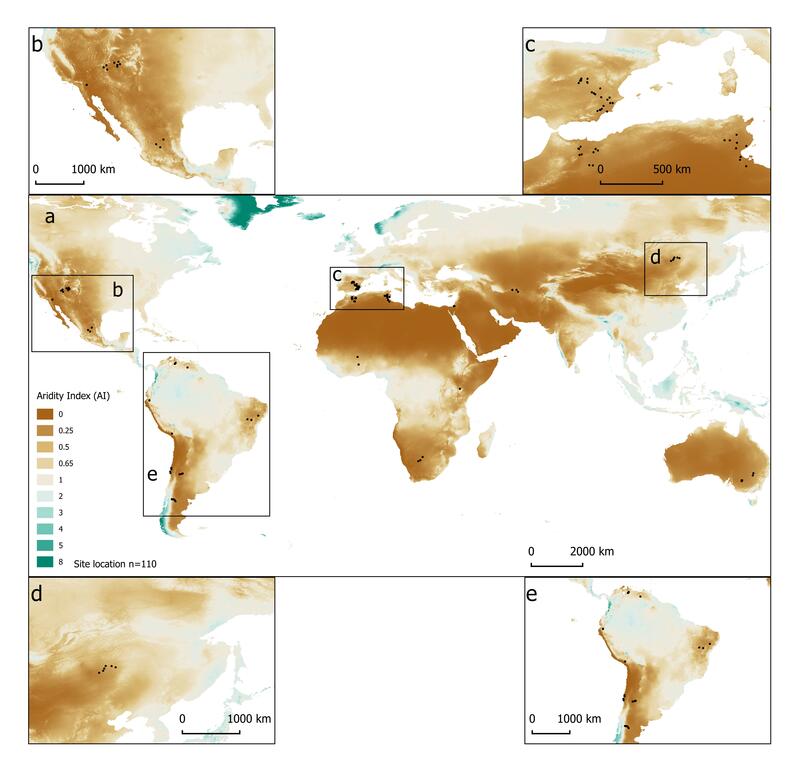 Specifically, we used 110 soils from different dryland sites distributed across all continents (Figure 1), spanning a gradient of mean annual temperatures (MAT) from -2 ºC to 28ºC. This soils were incubated at three different assay temperatures to evaluate soil microbial respiration response. We focused our study in drylands for two main reasons. First, drylands, which include hyperarid, arid, semiarid, and dry subhumid ecosystems, cover 45% of Earth’s land surface1. Additionally, as they are highly vulnerable to environmental pressures, their global extent is expected to increase during the 21st century due to ongoing climate change2. The second reason is that according to the latest review dryland soils store 32% of the global soil organic carbon3 and so, dryland ecosystems are relevant for the Earth’s carbon cycle. 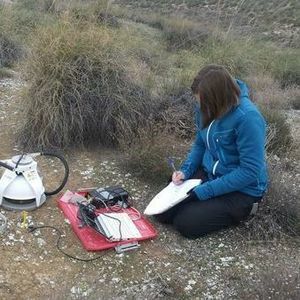 However, drylands are heterogeneous environments due to the patchy vegetation distribution and so soils under plant canopies have greater concentrations of organic carbon and other nutrients compared to adjacent open areas. For this reason, analysing the behaviour of both microsites (open and vegetated areas, Figure 2) is of paramount importance for understanding how these ecosystems function. Figure 2.- Dryland site in Australia where both microsites (open and vegetated areas can be observed). Credit: David Eldridge. On the other hand, we studied the soil respiration response to temperature because there are several studies that indicate that carbon losses to the atmosphere through soil microbial respiration increase with temperature4, representing a positive carbon cycle−climate feedback5 . This means a magnification of the anthropogenic climate change. However, some studies have observed that this positive effect of temperature on soil microbial respiration decrease long-term 6. The main reasons that may be behind this change are substrate depletion or evolutionary adaptation. Therefore, there are some studies that try to address which of these mechanisms is playing a major role7–9. Most of them consider that there is no thermal adaptation, and so substrate depletion is the only reason behind this change on the soil microbial respiration response to temperature8,10. Given that we both found that soil microbial respiration adapts to ambient temperature in two different ecosystems, we consider that this process may be taking place in all ecosystem types. As we are working at an ecosystem scale, we cannot ensure the mechanism underlying this thermal adaptation. However, we can confirm that soils from places with different MAT have different behaviours in response to temperature. Finally, according to the results of this study, we consider that microbial features should be included in the IPCC (Intergovernmental Panel on Climate Change) climatic models because doing so they could do more accurate predictions. 1. Prăvălie, R. Drylands extent and environmental issues. A global approach. Earth-Science Rev. 161, 259–278 (2016). 2. Huang, J., Yu, H., Guan, X., Wang, G. & Guo, R. Accelerated dryland expansion under climate change. Nat. Clim. Chang. 6, 166–171 (2015). 3. Plaza, C. et al. Soil resources and element stocks in drylands to face global issues. Sci. Rep. 8, 13788 (2018). 4. Frey, S. D., Lee, J., Melillo, J. M. & Six, J. The temperature response of soil microbial efficiency and its feedback to climate. Nat. Clim. Chang. 3, 395–398 (2013). 5. Tucker, C. L., Bell, J., Pendall, E. & Ogle, K. Does declining carbon-use efficiency explain thermal acclimation of soil respiration with warming? Glob. Chang. Biol. 19, 252–263 (2013). 6. Luo, Y., Wan, S., Hui, D. & Wallace, L. L. Acclimatization of soil respiration to warming in a tall grass prairie. Nature 413, 622–625 (2001). 7. Bradford, M. A., Watts, B. W. & Davies, C. A. Thermal adaptation of heterotrophic soil respiration in laboratory microcosms. Glob. Chang. Biol. 16, 1576–1588 (2010). 8. Hartley, I. P., Hopkins, D. W., Garnett, M. H., Sommerkorn, M. & Wookey, P. A. Soil microbial respiration in arctic soil does not acclimate to temperature. Ecol. Lett. 11, 1092–1100 (2008). 9. Schindlbacher, A., Schnecker, J., Takriti, M., Borken, W. & Wanek, W. Microbial physiology and soil CO2 efflux after 9 years of soil warming in a temperate forest - no indications for thermal adaptations. Glob. Chang. Biol. 21, 4265–4277 (2015). 10. Karhu, K. et al. Temperature sensitivity of soil respiration rates enhanced by microbial community response. Nature 513, 81–84 (2014).